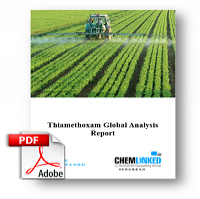 Thiamethoxam offers effective broad-spectrum pest protection on numerous crops around the world. Thiamethoxam is a second generation neonicotinoid insecticide, belonging to the thianicotinyl subclass of chemistry, and possesses unique chemical properties. Thiamethoxam interferes with a specific receptor site in the insect’s nervous system. Once insects feed on the plant or come into contact with thiamethoxam, feeding is irreversibly stopped and insect damage halts. Thiamethoxam is the active ingredient firstly developed by Novartis (now Syngenta) in 1998 in Brazil. After that, it grows fast and has been registered in 65 countries on 115 types of crops and applications, covering large scale of vegetables, rice, cotton, fruits, tobacco, potato and grains. The market share is only second to imidacloprid, rising from 7.46 billion USD in 2009 to 11.4 billion USD in 2012.